Some of the images of Hong Kong that stay with me the longest are sights I didn’t photograph because I saw them in passing or taking pictures seemed somehow inappropriate. (Thus the stock image of Queen’s Street). Often they are glimpses of people or things that exist in the cracks of the city, the in-between zones. This week’s imprints seemed to have a theme of visibility. The past couple of days I was in Central –the upscale financial district of Hong Kong Island— for the Hong Literary Festival that was held in Tai Kwung. 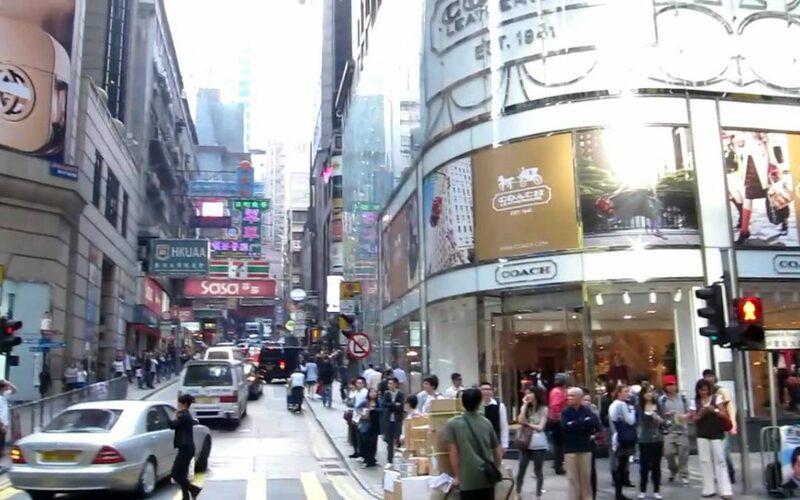 Like most of Hong Kong, Central is filled with even more people than usual on a weekend. On a busy section of Queen’s Road, which is lined with high-end clothing stores, I passed a heavy-set woman wearing ragged clothes who had made a bed out of newspapers and parked herself in the middle of the sidewalk. When I saw her, she was semi-reclining and eating her lunch, ignoring the steady stream of people who were forced to part around her home-made pallet. At the edge of her mat, she had arranged her belongings in plastic bags. I assume that she was begging although I did not see the usual cup or bowl. What struck me most about her was her unapologetic deliberateness in choosing and occupying that space. She was as determined to be seen as the crowd was determined not to see her. Then on the outdoor escalator to the mid-levels (I read on a sign that it is called a travelator), I spotted the gray concrete shell of an old four-story building sandwiched on all sides by shiny, new spires. Each end wall of the structure rose to a curved peak that framed a lovely moon-shaped window traced with iron but minus its glass. The ruin had no roof, but it did have trees. They had grown out of its upper story and even sprouted through its former windows. On the one hand, the building had clearly fallen into decay. On the other hand, by becoming a sort of garden, it was reclaiming its space by growing even taller than it had once been. During a break between sessions at the festival, my husband and I headed to a café in the mid-levels. Our high stools facing the street made for great people watching. We noted a family of Korean tourists, a European father with his hapa son, Sikhs making food deliveries by motorcycle, blonde tourists in backless dresses, backpacker types, ex-pats with Chinese girlfriends. As we commented on all the boutique restaurants in a single block, we focused on a tiny shop across the road that was selling Chinese ceramics. Sitting on a folding chair our front was an old man in his pajama bottoms and ribbed undershirt. While we watched, an ancient-looking woman emerged and perched on the empty chair beside him. “This area used to be all shops like that,” my husband said. “I wonder how long that one can last,” I mused. “But they look determined to stick it out as long as they can,” I said. Things move fast in Hong Kong. It won’t be long before the old man or the old woman dies or the rent becomes insurmountable. When that happens, they will close their shop door and leave the neighborhood to the expats and new immigrants. The ruined building will eventually be torn down and something new will go up in its place. The police will tell the woman on the sidewalk to move out of the way of all those well-heeled pedestrians. But for now, what I salute in that couple, that building, that beggar is a stubborn refusal to become irrelevant and invisible. What I want to say is this–I see you.